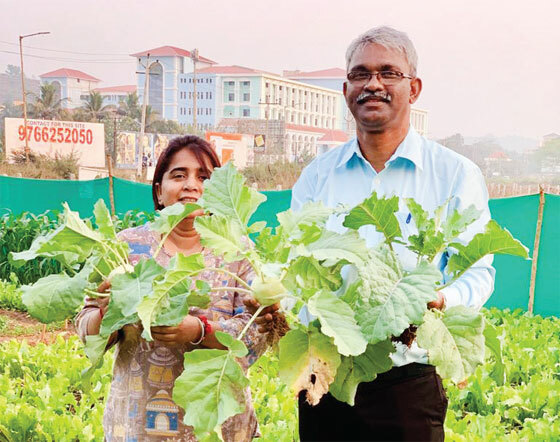 at Fatorda, in agriculture minister Vijai Sardesai’s backyard. First it was a bumper paddy cultivation using cosmic energy, and now it is vegetables; the Shiv Yog Cosmic Farming is showing the way towards healthy food. Usha Sardesai, who piloted this project near her house, wants to promote it across the state. She says her endeavour to reach out with this technique of passing on energy through meditation to the plants is irrespective of the fact that her husband is the state’s agriculture minister. “I used to practice meditation and cosmic farming when Vijai was not even an MLA. It is sheer coincidence that he holds the agriculture portfolio“ Usha said. The propagation of cosmic farming was not an easy task for Usha who had to fight myths, wrong perceptions and taunts while speaking about cosmic farming. She recalls how people used to taunt her that she has turned into Baba Ramdev. The original inspiration for cosmic farming stems from Shiv Yog Foundation, Gurugram, which has pioneered and propagated this technique.First, the project of paddy cultivation was taken up by Usha which saw astonishing results during last year. “That is when I decided to experiment on vegetables“ she said. To her surprise, the pilot project on vegetables was successful, and the quality of vegetables that were grown proved that cosmic energy does work on plants’ growth. “The meditation has to be done for 30 minutes. It is a process of 365 days. As you meditate, you are tapping energy in you, which is good for yourself also. Same energy has been transferred to the paddy field or vegetable cultivation. It is all positive visualization,” she explained. The vegetables were grown without any fertilizer or any external element other than water. Buoyed by the results, Usha wants to copy the project across the state by involving self help groups. “I want to teach them the technique, you need not come to the field to do it. You can meditate from home also. You can meditate from any part of the world and send the energy. You don’t have to be geographically present there,” she said. She stated that the plot where she grew vegetables was traditionally a paddy field. “vegetables were never grown there. This is the first time it is being grown. After cultivating paddy, they used to leave it like that,” she said. This June, she wants to grow paddy again in the same plot, so that the land does not remain unutilized. “I want the people from the rest of the state to follow this. I am filming a documentary so that we can teach others also. We have been travelling“ she said. Usha has travelled in the mining affected areas where she is inspiring the people to take on agriculture with cosmic energy. “We want to teach them that agriculture can also give you gold; in a healthy way. Earth is mother so we should use her to produce which will give her due respect. We should not let her remain abandoned,” she said. Talking about the cosmic energy philosophy, Usha said “universe never curses you or blesses you. It all dependents on the vibrations that you send. If you send positive vibration you will get positive results; negative vibrations, negative results.” she said. Usha intends to spread the awareness about cosmic energy across the state. “Food has no religion. Here I am trying to give healthy food which has no religion“ she said. “The final aim is only to give most healthy food. Every person has a right to have healthy food,” she added.